Oh Miss Biscuit you are a cutie pie Kitten! I think that you and Camille are my fav kitties this litter! I think she's saying, "I like you mister, will you be my human?" I think he needs to take her home!!! The look on her face in the last picture seems to say, "That's MY Grandpa!! And you can't have him! Neener neener." *heehee* I agree with everyone who wonders how your Dad can resist such a sweet face. he seems to be a sort of 'kitten magnet'. this one is a very stong attachment. Hey, my reply is, "Who DOESN'T have it bad for your Dad?" 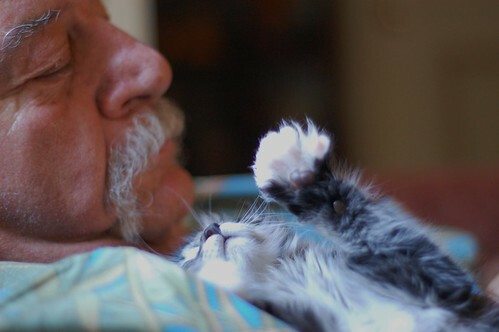 I love the picture of Biscuit playing with Dave's mustache! They're both adorable! Your dad's shirt is awesome! 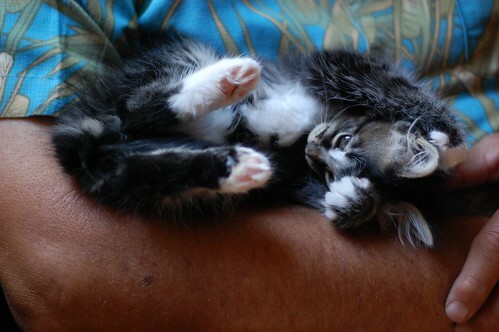 I love the fur between those cute little kitten toes. I hope the human that chooses her is just as loved! So sweet! 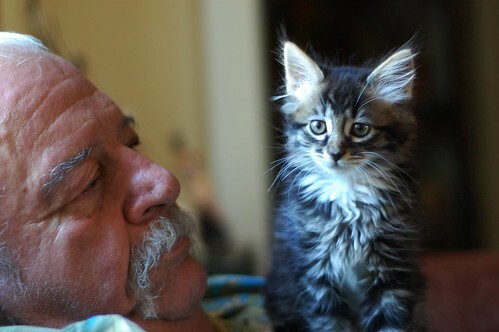 Though she would be quite content staying in those arms and in paw's reach of the mustache! Oh, my, she has fallen hard for him! "I've got a crush on you....Davy Poo"
As Cynthia pointed out - who doesn't??? 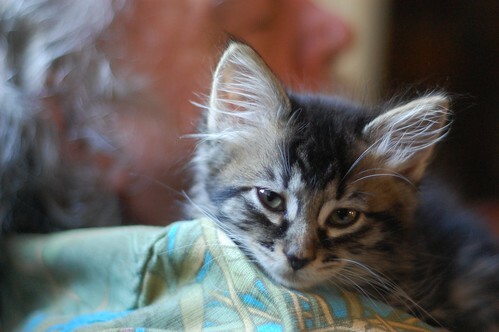 But darling Biscuit is clearly besotted with her foster grandpa. And bless his heart, Dave's returning that love many times over, like all the very best grandpas do. 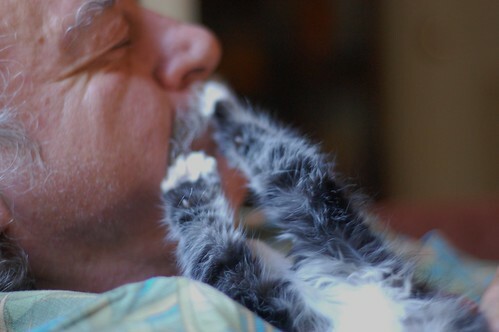 Especially love the pic of Biscuit trying to touch your Dad's moustache. So cute! 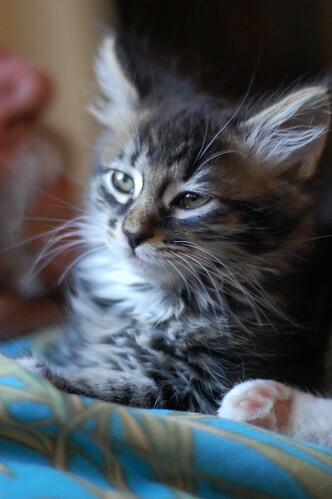 She is going to be one gorgeous ladycat.